Title: "Along came a Spider!" 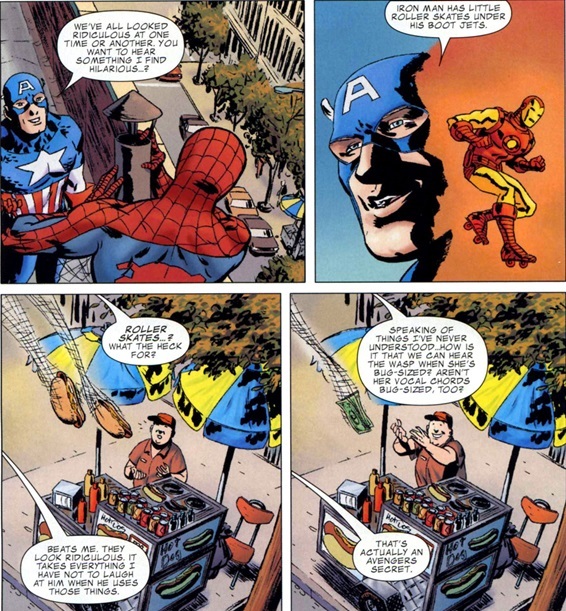 The Avengers never actually met Spider-Man in Avengers #11, but it seems that the adventure with Kang's robot has caused Captain America to seek him out. 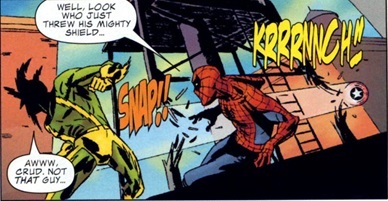 Cap comes across Spider-Man while he is fighting Electro. I don't know about Cap calling anyone a nerd, but in general there's some good characterization here. 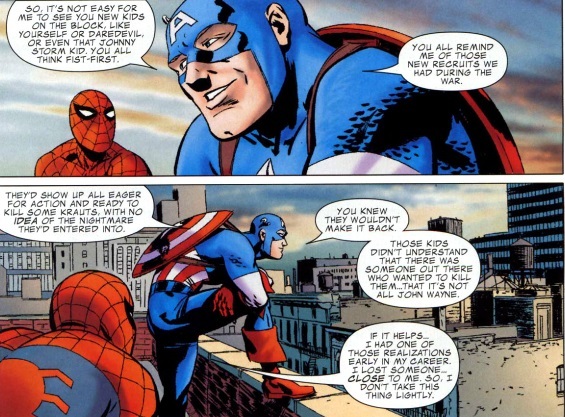 It's also worth noting that Cap has figured out that Spider-Man is a teenager. 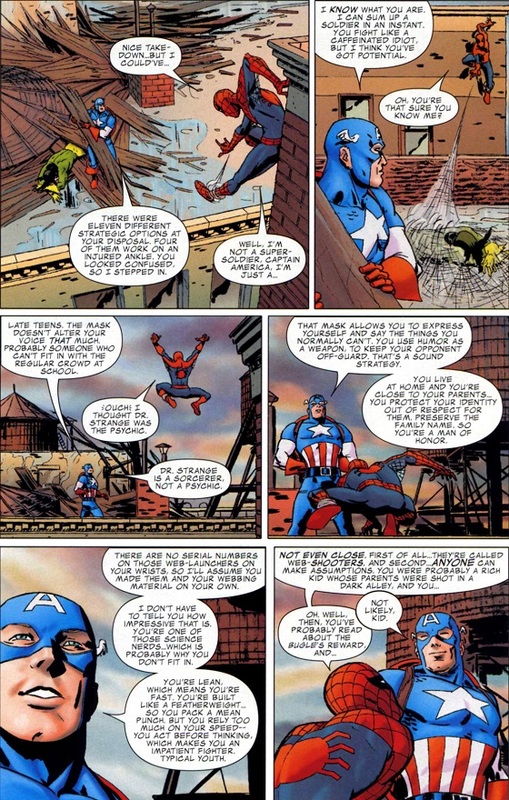 That relates to some old comments that were made on Amazing Spider-Man #4, and it also means that Cap, at least, knew that Spidey was a teen when the Avengers later try to recruit him in Amazing Spider-Man annual #3. 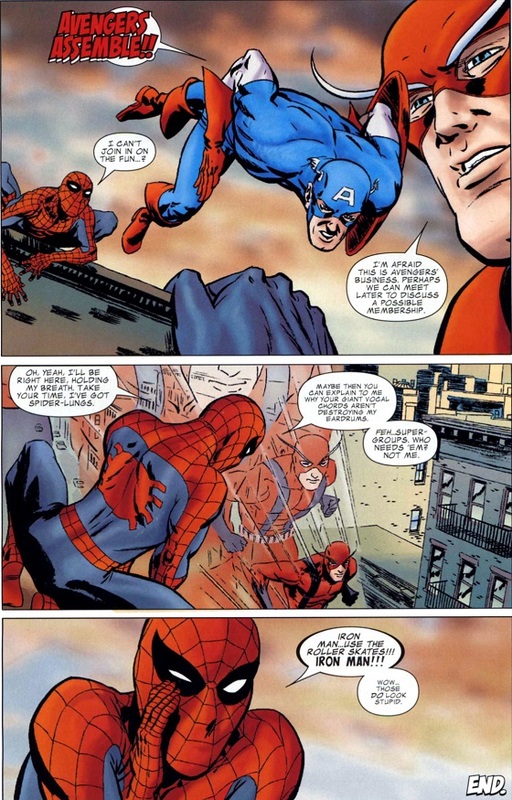 Cap decides that he's going to trust Spider-Man. And they continue to hang out and shoot the breeze. 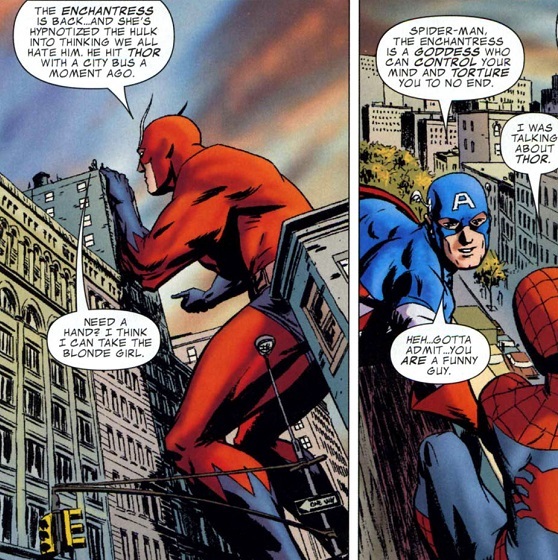 Cap actually does hint that Spidey might eventually be welcome in the Avengers. Then Cap is called away. It takes some liberties, but for the most part it's an enjoyable conversation that feels true to the characters. I think it's the best of the Avengers Classic back-ups. And i had never even heard of Tom Beland before this. Chronological Placement Considerations: Unlike every other Avengers Classic back-up, this can't take place shortly after the main story, because Iron Man was missing during Avengers #11 and didn't return until Tales of Suspense #63, but he's mentioned as appearing in this story. So i've put this in its own entry, after Tales of Suspense #63. Enchantress, Thor, Iron Man, and Hulk are off panel but clearly "appearing" in the sense that they should be tagged. I suppose it is possible that the Hulk's appearance could be written off as an illusion of the Enchantress or something like that. The Wasp isn't mentioned as appearing, so i'm not tagging her. 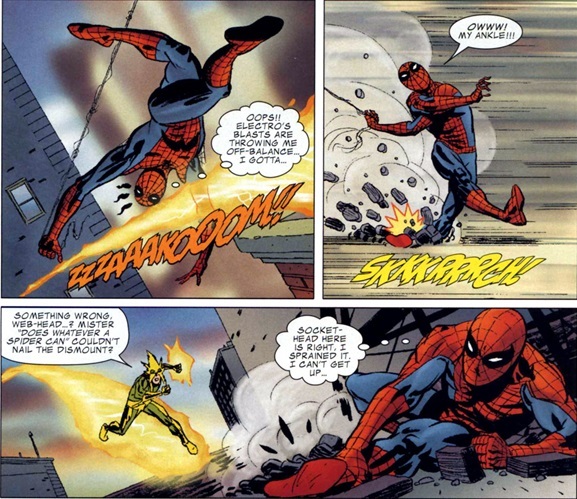 Spider-Man makes a couple of references to Amazing Fantasy #15. I had never heard of Tom Beland either but that is some good dialogue. Haim Kano does a nice job on the art, too, yet. Those guys should definitely have done more stuff. Oh yeah, in total agreement, the best of the backups by far. The best writing and the best art. Wasn't aware of this story, but it seems a nice addition as a conversation they might have had if 60s comics were more decompressed, even if Stan didn't write Cap or Spidey this way at the time. From the scans, this doesn't seem as bad a "humble gushing fanboy" as other recent examples so I was expecting worse than this from seeing your comment. One related thing that slightly rankles, but I usually just put up with it, is portraying Cap as if he is physically older than other heroes. He was about 20 when he became Cap which makes him about 25 at the end of WWII when he was frozen & didn't age in that time, or at least aged more slowly and was unconscious. Sure, he was born earlier, is a "man out of time" & everyone he grew up with is old or dead (depending on the sliding timescale of how long it's been since WWII), but while he would be nearly a decade older than Spider-Man, he couldn't be much older than Daredevil who is old enough to be an established lawyer, and at the time, Reed and Ben would have been physically much older than him as they were WWII vets who weren't frozen. Sure, those 5 years he spent in WWII would be much more intense experience than other superheroes with 5 years experience, and I wouldn't want to see him portrayed as anything other than a complete pro, but he always seems to be portrayed as if he has many years more experience rather than just 5 years. Agreed this is a good story, another of the highlights of the Avengers Classic back-ups. 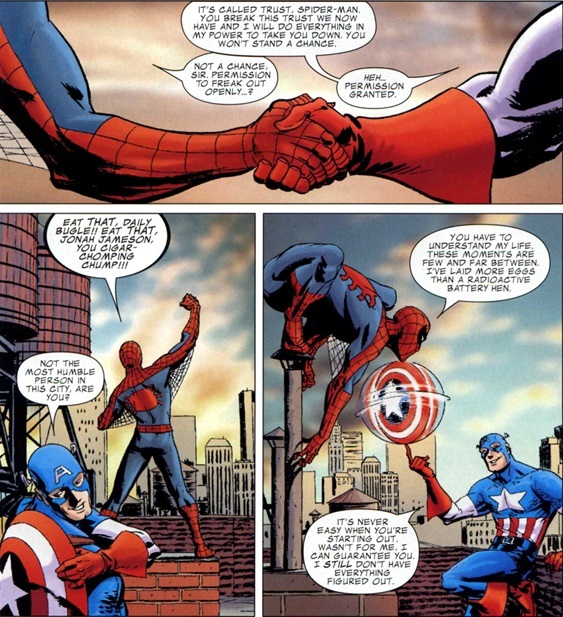 I think Spider-Man would *probably* be more of a fan / respectful towards Captain America than he would be to the Fantastic Four. Cap *is* a living legend on , an iconic hero who fought in World War II, who was presumed dead for decades, and who at this point had only just returned a few short months ago. 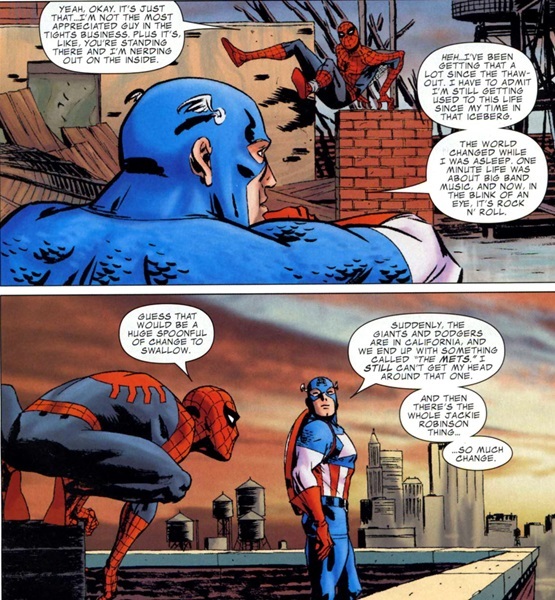 It makes sense that even an irreverent, sarcastic joker like Spider-Man would be somewhat in awe of Cap. Yeah, I never did like Cap being written as if he was significantly older than other members of the Avengers. Nothing made him seem more like an old fogey than his habit of calling other people "son." But, again, Spider-Man is a teenager here, and has to be at least a decade younger than Cap, so I can see Cap treating him a bit like a kid. I just thought it was funny how Spider-Man, Daredevil & Human Torch were all lumped in as "the new kids" even though Daredevil must be closer to Cap's age. And Cap has to be referring to age rather than inexperience, or he wouldn't have mentioned Johnny Storm, who got his powers before most of the Avengers did. The worst example of "gushing fanboy Spidey" has to be Spider-Man/Fantastic Four 2, which takes place after Secret Wars and features Peter gushing over Reed. By that point in Peter's career, he shouldn't be that awestruck about Reed. Tom Beland is great! I highly recommend his True Story, Swear to God series that he writes and draws himself. It's a comedy/romance series from his POV. Beland will pop up later in the chronology on some FF one-shots that came out during the Millar and Hickman runs. 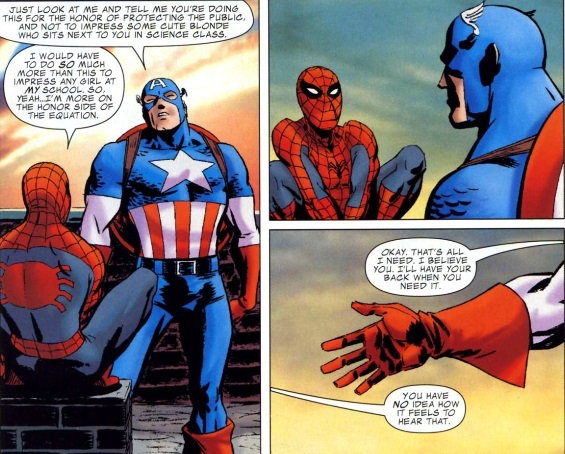 How does Cap know there's no serial numbers on Spider-Man's web-shooters? I for one can see the usefulness of the roller skates for Iron Man in situations where flying wasn't necessary, since running in an iron suit would be difficult for anyone. However, that's not to say the sight of Shellhead on wheels doesn't deserve a few chuckles, like he's taking the premise of the film "Rollerball" (I'm thinking the original with James Caan and John Houseman, FYI) to its logical extreme.